We thought we emptied all, but during the last weeks we took more plaster of the walls, removed some layers from a floor and thus, generated another 2,5 tonnes to bring to the dumping ground. Amongst some very old asbestos tubes, which to dispose was quite expensive. After all, we started to build a new floor in the third level. We want to be sustainable, re-use old materials if possible and if we need to buy new material, than it should be as natural as possible. water and of course, a mixer. You need to find a measure, we used our bakery bowl 😉 to have always the exact proportion. The hemp fibers needs to be the first in the mixer, with a bit water to let them swell a bit, than add the sand, water, lime, water, gypsum. Mix all until you get a pulp, not too liquid, not to strong, something like mashed potatoes. You have a bout 15 minutes to bring it onto the floor, than it’s set. 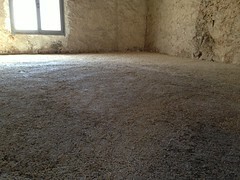 The whole floor dries for several days, depending on temperature and humidity of your environment and it smells when the lime carbonation starts. To finish the floor, you need to cover this layer with air lime-sand screed, which can be done immediately after placing the first layer with the hemp fibers. 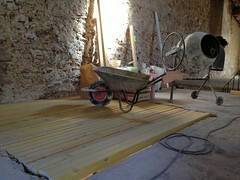 Both together will be a perfect underground for tiling with old or handmade tiles, e.g. terracotta tiles.